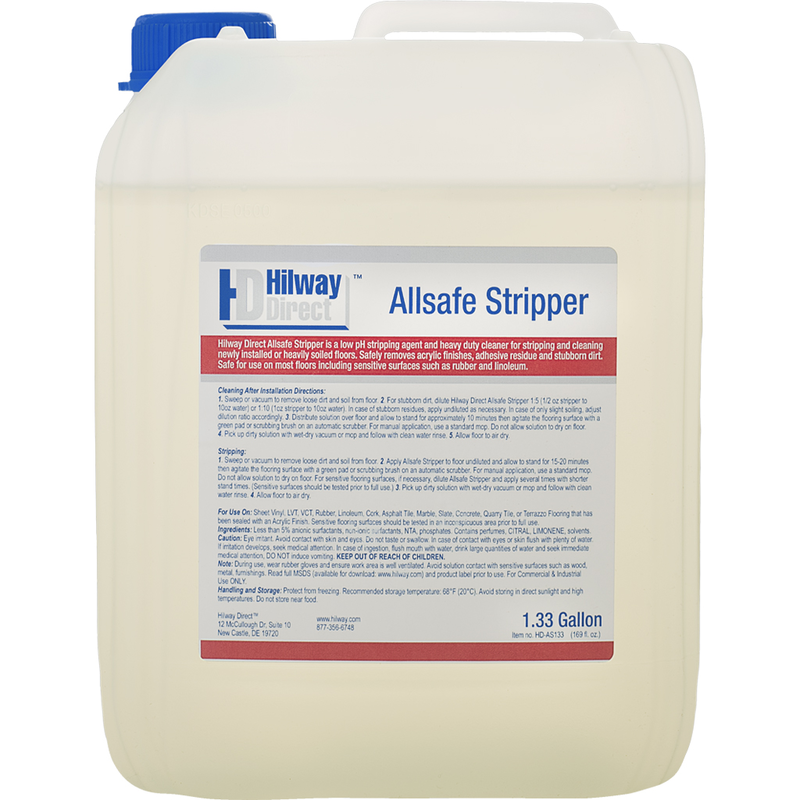 Safely remove floor finishes, heavy dirt buildup, adhesive and more from resilient floors with Hilway Direct Allsafe Stripper. In a 1.33 Gallon size (5 Liters), this safe stripping agent, degreaser and heavy-duty cleaner designed for tackling tough dirt, stains and buildup on newly installed or heavily soiled vinyl, linoleum and rubber floors. It may be used to strip away serious dirt and stains on sheet vinyl, LVT, VCT, rubber, linoleum, cork, asphalt tile, marble, slate, concrete, quarry tile, or terrazzo flooring that has been sealed with an acrylic finish. Heavy-duty Allsafe Stripper is highly effective in the removal of old care products, acrylic finishes and adhesive residue. Be sure to use Allsafe Stripper diluted according to label instructions or per flooring manufacturer specifications. Use with mop and bucket or auto scrubber. Coverage per 1.33 gallon container - Cleaning After Installation: 600-1000 square feet; Residential Stripper: 1600-2500 square feet; Commercial Stripper (undiluted) 300-500 square feet. Safety Information Sheet: Hilway Direct Allsafe Stripper MSDS. Sweep or vacuum to remove loose dirt and soil from floor. 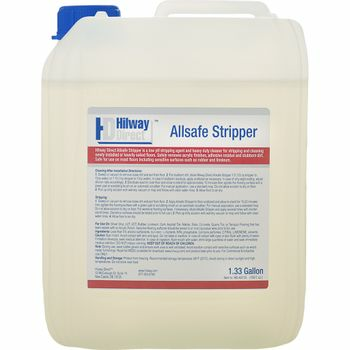 For stubborn dirt, dilute Hilway Direct Allsafe Stripper 1:5 (1/2 oz stripper to 10oz water) or 1:10 (1oz stripper to 10oz water). In case of stubborn residues, apply undiluted as necessary. In case of only slight soiling, adjust dilution ratio accordingly. Distribute solution over floor and allow to stand for approximately 10 minutes then agitate the flooring surface with a red scrub pad or scrubbing brush on an automatic scrubber. For manual application, use a standard mop and scrub brush. Do not allow solution to dry on floor. Pick up dirty solution with wet-dry vacuum or mop and follow with clean water rinse. Prior to use always test finish remover / heavy duty cleaner in a small inconspicuous area to check for compatibility and desired result, especially for sensitive flooring types. During use, wear rubber gloves and ensure work area is well ventilated. A stripped floor is slippery. Use caution signage to prevent traffic on stripped floor until flooring finish is applied and properly cured. Slip-resistant footwear is recommended for individuals who need to walk on the stripped floor and for those applying stripping solution to floor.